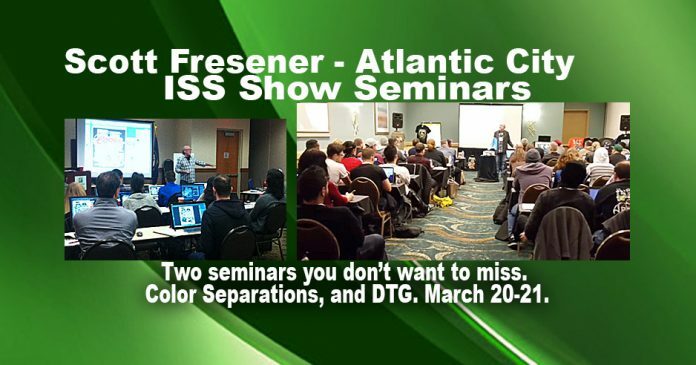 If you are going to the Imprinted Sportswear Show in Atlantic City, March 21 – 23 then don’t miss fearless leader Scott Fresener who is doing two seminars at the show. Here is what to expect and we hope to see you at one of these sessions. Basic to advanced techniques in Corel, Illustrator and Photoshop. How to color separate in each program. How to trap and choke images so they print better. How to output halftone dots. How to make separations that are screen print friendly. How to work with low quality artwork. What to look for in machines. Determining how it fits with your company. How to keep your machine happy. How to make money with DTG. Lots of misinformation out there. The current state of ink and machines. Next articleCatch the ISS Long Beach Show Review with Fresener and Greaves.